Made these in advance for my mum in conjunction with Mother's Day. 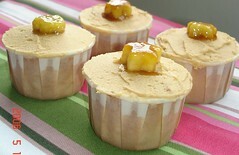 Recipe taken from cupcakes year-round except I used a different source for the peanut butter frosting and instead of topping with nuts as recommended, i topped them with caramelized bananas...wonderful! Love the carmelized banana idea! One comment about the cups you used, though. I saw them here? somewhere a couple weeks ago and thought they looked pretty cool, but they're not very practical -- the lip on the top of the cups makes them almost impossible to tear manually, but I didn't discover this until baking up several dozen. I ended up having to snip each one with scissors in a couple spots to make them easy to unwrap. I probably won't use them again unless I make something really gooey that needs to be eaten with a spoon or fork and doesn't need to be unwrapped.